This article provides in-depth fundamental analysis of Kovai Medical Center and Hospital Ltd (KMCH), a super-speciality, multi-disciplinary hospital based in Coimbatore (aka Kovai), Tamil Nadu. I’m an eighteen-year-old student and an enthusiast about investing. We recently met at Professor Sanjay Bakshi’s seminar in Mumbai at BSE and I and my friend got a chance to talk to you regarding our research. I have been reading – ‘Kovai Medical and Center and Hospital Limited’ a small-cap hospital company based out of Coimbatore, to convey and test my investment thesis on it, I have written a research report on it. I was hoping that if you could provide me with a feedback regarding my investment thesis. Kovai Medical Centre and Hospital was incorporated in 1985 and began its operations in 1990, what was started as a 150 bedded hospital, in the small town of Coimbatore, under the leadership of Dr. Nalla G Pallaniswami has turned out to be a multi-disciplinary, super-speciality hospital with a total capacity of around 1000 beds with more than 40 medical departments and 20 operations theatres. Today KMCH stands as one of the largest corporate hospitals in the state of Tamil Nadu, employing approximately 4000 employees with state-of-the-art infrastructure and advanced medical equipment making it one the most advanced facility in India. Although a lot of these medical equipment and operational procedure would make up for just complicated jargons, it isn’t difficult to make out that KMCH, in its limited communication to its stakeholders, talks a lot about these latest breakthroughs and advancements. KMCH has its oldest and most sophisticated establishment in Coimbatore – which makes up for around 750 beds, with 4 peripheral centres, 2 in Coimbatore and 2 in Erode. I have divided the idea of the business model into nine simple categories in order to make better sense out of it. As I mentioned before KMCH believes in giving its customer the most advanced and sophisticated medical treatment they could possibly imagine to get in Coimbatore. The hospital has NABH (National Accreditation Board of Hospitals) accreditation for all its departments. KMCH specialises in the most complicated and scarce surgeries conducted in the medical space, for example, cardiac transplant which has been around for four decades, erstwhile was just practised in two cities in India viz. New Delhi and Chennai, was started in Coimbatore in 2014. KMCH is a pioneer in interventional radiology and has emerged as one among the three centres in the country to perform the most complex form of aortic surgery. The latest addition to this list of upper-end treatments is a liver transplant and the comprehensive cancer centre and steroid-free transplants. In a way, KMCH has garnered a niche for itself in practising complicated surgeries, transplants and operations. This drive for innovation keeps KMCH on its toes. There aren’t any separate customer segments to which KMCH caters, although its advanced and modern medical treatment makes KMCH a destination for the more quality conscious market – i.e. middle and upper middle class. In FY16 KMCH recorded sales revenue of 473cr up from 72cr ten years back recording a CAGR 22.94%, and 16.12% for the past 3 years. The growth in the revenue has come down in the past 3-5 years – my guess – this has happened mainly due to fuller capacity utilization at the main KMCH centre which accounts for more than 4/5th of the revenue, although utilization rates are not given by the hospital, rating reports have stated them to be upwards of 90% in 2010-13. Revenue streams of KMCH essentially come from three activities – treating patients, pharmacy and dietary. In medical parlance, a patient who stays in the hospital for his/her treatment is called as an ‘In-patient’ and the person who visits the hospital for examination by a consultant or doctor is called as an ‘Out-patient’. At KMCH In-patients have been forming anywhere between 55-59% of the total revenue for the past decade, while treating Out-patients accounts for anywhere between 19-20% of the revenue. In and all treating patients account for nearly 75% of the revenues. 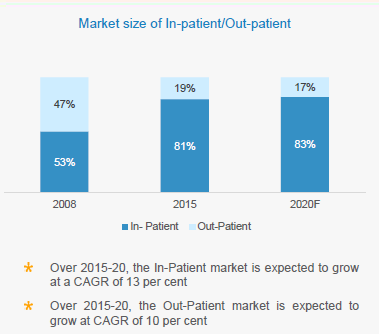 A bigger share of In-patients market is mainly due to KMCH’s specialisation in various surgeries, transplants, etc. and due to the larger and growing share of In-Patients market in general. Pharmacy revenue accounts for all the pharmacy products sold at the hospitals and at a few pharmacy outlets established by the hospital, it has accounted for anywhere between 19-20% of the total revenue for the past 8 years. Dietary revenues are on the account of consultancy provided by dieticians and from the sale of dietary products. This is the youngest revenue stream and provides for nearly 3% of the hospital’s revenue. In general, all the revenue streams have grown proportionately, with no one stream showing differentiated superior growth. All of the revenue streams have proved to be profitable individually over the years, although all of the costs can’t be demarcated into different groups, at the most basic levels pharmacy gross profits i.e. (Pharmacy sales – Pharmacy Consumption) has earned an average of 20% for the past 8 years. At the same time, dietary gross margin i.e. (Dietary Sales – Dietary Consumption) has grown from around 15% in FY09 to nearly 30% in FY10. There isn’t any variation between the performance of the hospital in different quarters, with all of them contributing roughly a fourth of the revenue, year after year. All revenue streams generate plenty of cash with receivables and debtors hovering around 2-3% of sales. Also, I do not observe any kind of cyclicality in the almost recession-proof revenue streams of KMCH or hospital’s in general, with minor dependence on disposable income. A hospital is a cost-intensive business, this leaves KMCH with operating margins (excluding other income) revolving around 20%, generally operating profits is a good measure of operational performance of a company (especially a manufacturing company), however while looking at service providing companies it is better to list down the most crucial cost related to the most important activities for rendering the given service and compare the trend over time. The biggest cost of operating a hospital generally is ‘Employee Benefits Expense’. Doctors, Nurses and Paramedics take a large piece of revenue for their services. At KMCH ‘Employee Benefits Expense’ as an accounting head currently takes 17% of the revenue, up from 12% eight years back. In the medical field generally all of the Human Resource isn’t employed permanently, according to NSDC only 44% of the staff employed in medical industry is permanent rest 56% are employed on a contractual basis, hence there is another expense that the hospital pays to doctors and consultants for their services, which is recorded as ‘Consultant Charges’ under the heading of other expense. Consultant charges as a % of sales come out to be 17%, together these two comprise a third of the sales revenue. Expenditure in pharmacy has been around 15-16% of the total revenue – in the past decade, however when compared to just pharmacy revenue – it leaves an operating margin around 20%. These 3 costs make up for about 70% of the sales revenue. Hospitable consumables and Medicines are purely variable costs and the hospital doesn’t carry much inventory as medicines and consumables throughout the year, employee benefits expense may not be purely variable – however over time can be adjusted to the number of patients the hospital receives and the subsequent revenues. Hence after achieving decent utilization rates, which KMCH has, there isn’t much operating leverage to benefit from as the majority of revenue comes from the original establishment which is already recognised. KMCH gives utmost important to continuous medical education programme (CME) for training its doctors, nurses and Para-medical staff, it also organises a lot of national and international medical conferences. Dr. Nalla G Palaniswami (Chairman and MD) and Dr. Thavamani D Palaniswami (Vice-Chairman and JMD) have also started ‘Kovai Medical Centre Research and Educational Trust’ – although this organisation is a separate entity in itself and isn’t affiliated with KMCH, I believe it still helps nonetheless to acquire scarce medical talent in nursing and medicine. Dr. Nalla G Palaniswami has also incorporated Dr. N.G.P Institute of Technology. In all, KMC Education Trust has more 10 institutions with more than 1100 staff members and 120000 students. As mentioned before, KMCH gives utmost importance to the advancement of medical equipment, procedures and technologies. This obsession calls for huge and continuous investments for rapid innovation. The above chart shows the growth of total gross block and its composition. Are these resources only a product of capital? Or do they require something else? Definitely, these two resources aren’t just a product of capital. KMCH employs nationally and internationally renowned specialists like Dr. Prashant Vaijyanath, Dr Olith Selver, Dr. Magnus Jayaraj. Specialists like these from more than 40 operational departments who have over years and decades of experience and expertise in working with state-of-the-art technology and delivering such difficult and intricate performances in the field of medicine. Although the company doesn’t provide its stakeholders with attrition rates, it would be very helpful and crucial to see attrition rates in order to judge its ability to retain human resource. The key activity performed by KMCH is to deliver world-class healthcare services to its patients, conducting comparatively difficult and scarce medical procedures and continuously upgrading infrastructure at par with global standards in order to keep its brand name intact. There aren’t any formal partnerships, joint ventures, outsourcing arrangements that the business is a part of. However, as mentioned earlier, about the involvement of Chairman and Vice-Chairman in various educational institutes and organisations, which I believe helps them acquire scarce medical staff with relative ease, given that medical students and nurses have to participate in field training as a part of their education. The hospital’s aim is to provide better quality healthcare to it patients. There isn’t any customer relation department or after sale service activity as one isn’t required in this business. The company organises many free medical camps, awareness programmes and public sanitary facilities as a part of its CSR activities, which also help in publicising the name of KMCH. The participation in various educational trusts and institutes lead to immense popularity in the medical field amongst prospective medical staff. I wouldn’t break much head in analysing the possibility of growth in the healthcare space because following facts convince me that more or less this industry is bound to grow in India, whether it is the matter of revenue, investment, people employed or patients treated. India is an immensely underfunded country in terms of healthcare infrastructure, the global bed density per 10,000 people is 27, while in India it’s just 7, other developing countries like China and Brazil also have substantially better bed densities i.e. 23 and 29 respectively. As seen in the above chart, healthcare spending as a % of GDP in India is just 3% while the global average is 8%. The state of healthcare spend in other developing countries is also far better as compared to India. However what takes all of the attention is the third bar; according to it private sector in India is spending a staggering 70% of the total healthcare expenditure. It is quite clear that despite the poor state of healthcare in India, the majority of investments in healthcare space are going to come from private sector, which leaves them with huge opportunities. 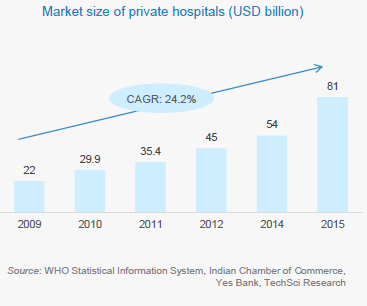 Being the torchbearer of investment in the healthcare sector, it is quite obvious that the market for the private hospital is going to grow at a tremendous pace. 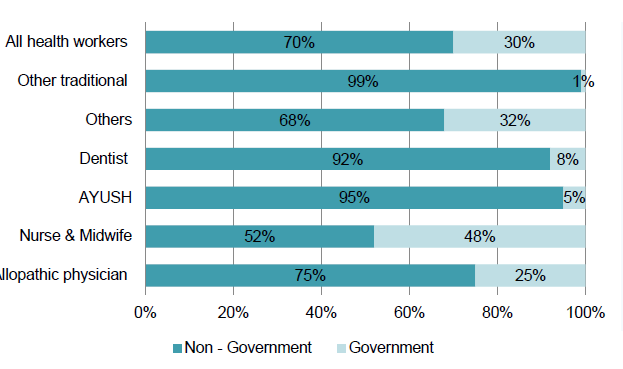 Private sector’s share in hospitals and hospital beds is estimated at 74% and 40% respectively. According to 2017 report of Indian Brand Equity Fund on Healthcare industry, the number In-Patients (people admitted to a hospital for their treatment) has been on the rise taking up as much as 81% of the total market. 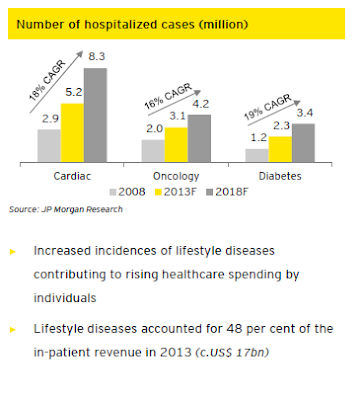 The rise in the number of In-Patients can be mainly accounted for the increasing share of lifestyle diseases like Cardiac, Diabetes, and Oncology etc. And this trend is expected to continue because of the change in demographics of the country – India’s population above 45 years of age is expected to increase from 22% of total population to 26% by 2021 (Expected), the larger the number of senior citizens and mid-40’s the larger the market for hospitals – especially In-Patients. The following diagram shows the growth rate of anywhere between 16-19% in the number of hospitalised cases of the three most occurring lifestyle diseases. What about the Human Resource? As stated before, Human Resource is one of the most important resources in running a hospital, unfortunately, India lags behind in even this aspect. The global average of doctors and nurses per 10,000 people is 13.9 and 28.6 respectively while in India it is 7 and 17.1 as of 2015 (WHO 2015). Although India produced upwards of 25,000 postgraduate medical students till the year 2015, India faces a problem with retaining good talents, mainly due to competitive pay and better working opportunities abroad. 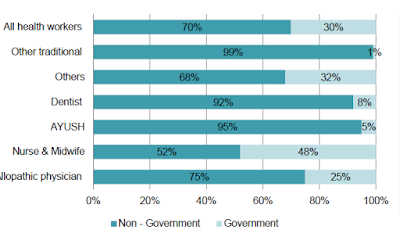 Doctors and nurses hardly prefer to work in government hospitals due to their poor pay and infrastructure, which poses a big challenge for the government. As per the National Skill Development Corporation (NSDC) report (2013-17, 2017-22) about 70% of health workers are employed in Non-government organisations. The problem for lack of medical talent still persists, however it is less severe in the private sector given that there is a preference amongst medical staff to work in the private sector. Although Michael Porter’s work – in analysing the competitive advantage, analysing an industry through his celebrated five force model framework – is phenomenal, I for my own understanding have altered it slightly and formed the following checklist to better comprehend the industry and the company’s positioning in it. Q. Do the suppliers of this industry command bargaining power? If yes, A) Does the industry has the ability to pass on this cost to its customers? If yes, then is this the only time when the company can increase its price? B) Does the switching cost work in the favour of the ‘Industry’ or the ‘Supplier’? The major suppliers for any hospital are its suppliers for – Medicines (Pharmacy), Hospital Consumables, Medical Equipment and Human Resource. Suppliers of generic and the most basic level of supplies may not command pricing price, however specialised patented medicines, advanced equipment – have pricing power, nonetheless, the hospital can pass on these cost for specialised treatments to their patients. There aren’t any switching costs in the Hospital industry with their suppliers, however, in certain cases – where the hospital’s image is a shadow of a single doctor or a small group of doctors – there might be a problem as doctors can leverage this to increase their compensation. Is the same applicable to the company under study? Given the specialised and niche services provided by the hospital, KMCH possesses the power to charge its customers for its services and to compensate for any increase in its cost. These niche treatments also make KMCH a good choice and sometimes the only choice for their patients. Pharmacy and Dietary, as revenue stream margins are also either stagnant or growing, indicating that KMCH can charge patients for its costs. At KMCH there are numerous doctors and famous specialists who make up more than 40 different departments, so there isn’t any single doctor or departments whose image overpowers the hospital as a whole. Q. Is the industry ‘Price Taker’ or ‘Price Maker’? Q. Is the value proposition of this industry undifferentiated, except for price? Do the buyers of this industry command bargaining power? B) Are the switching cost working in favour of ‘Buyer’ or the ‘Industry’? Services definitely aren’t homogeneous throughout in all hospitals in any city, district or country. Hospitals visits are a factor of the satisfaction and experience that a patient receives during his/her stay, and hence it won’t do any good to compare prices for treatments between any two random hospitals. Buyers of health care services should be categorised into two categories to make sense out their different set of requirements – one category is the ‘lower income group’/poor who form more than a substantial part of India’s population, the second category will be the ‘middle-class’ and the ‘upper middle-class’. While quite obviously for lower income group – government facilities, trust/charity based hospitals and low cost (although for profit) healthcare providers like Narayana Healthcare become more lucrative. These low-cost providers are bound to benefit the most from the medical inclusion of the lower-income group. Middle-class and Upper Middle-class aren’t exactly ‘price-sensitive’, instead they seek affordable or reasonably priced, but QUALITY healthcare. As such there aren’t any monetary switching costs at a place in between a hospital and its patients. One argument, which could be expected is that – patients getting treated for lifestyle disease (whose treatment last over a few years) may find it uncomfortable to shift from their regular doctor or hospital. However, a patient generally considers the cost before getting comfortable with a doctor – as in if the hospital isn’t affordable the patient may find a more inexpensive alternative if it is affordable – the patient will not break his head over saving some money and risk his health. KMCH’s motto isn’t to serve the lower-income group with the lowest possible cost structure at the place, instead, it chooses to provide quality healthcare services (which in many cases are scarce and indigenous) and charge its patients for those services. Hence KMCH’s proposition to an extent is differentiated – which keeps the pricing power intact. Q. Is this industry very competitive? If yes, A) What form does this competition take? B) Does this competition mean taking a hit on price, cost, or both? The industry as a whole isn’t very competitive, given that there is a huge gap between demand and supply, however, this may not be the case in all the geographies or categories. Some geographies (especially metropolitans) have a substantial number of hospitals, which provide although scarce but similar services, this may result in regional competition between a few players. GKN Memorial Hospital – GKNMH was started way back in 1952, it has more than 580 beds and it was the first hospital in the state of Tamil Nadu to be certified by NABH. PSG Hospitals – PSG is a multi-disciplinary 900 bedded facility. KG Hospital – it is 350 bedded multi-disciplinary hospital, with over 250 doctors and surgeons and a supporting staff of 800. Sri Ramkrishna Hospital – started in 1975, it is a 700 bedded fully equipped hospital. Hence this factor poses a problem for KMCH. Q. Is the industry visibly very attractive to new entrants? If yes, A) What are the strengths of entry barriers that place existing players at an advantageous position, if any? B) What kind of retaliation should a potential entrant expect, should it choose to enter this industry? Although operating margins are decent, the capital intensiveness and continuous requirement of capital to keep infrastructure at par with industry standards make it less lucrative. In fact, if I were to classify hospital business in Warren Buffett’s – Great, good and gruesome category, it would be in the ‘Good’ category as although it has good returns, it requires continuous investments to grow and maintain those returns. Although given the vast size and underfunded investments, there isn’t any aggressive retaliation that could be expected from incumbents if a new player were to join this industry. Q. Is there any aspect where the value proposition of this industry lacks significantly? If yes, A) Are there any probable substitutes satisfying this problem? If yes, B) Does the benefits of substituting this proposition outweigh the cost, and by what margin? Healthcare services as a value proposition lack significantly in its availability and affordability to the public. It is hard to think of any kind of probable substitutes to healthcare services. Q. Is this industry of strategic importance to the government? If yes, what is the frequency of interference by the government? Definitely, this industry is of strategic importance to the government but in a good sense. Since the government lacks the resources to build up health care services at necessary levels, the private sector investments are more than welcome. Q. Is this Industry ‘Technology Driven’ or ‘Technology Enabled’? The degree of risk that medical service providers are exposed to depends on the medical services they are catering to. Just as an example – hospitals these days (Including KMCH) have started to carry out surgeries using lasers and robots for minimum incision, compare that to a common medical operation like that of removing the appendix. Which medical procedure poses more risk to technological obsolescence? Definitely, the one which is providing services so rare, and whose medical equipment and procedures are far more expensive – such hospitals need to be on their toes all the times when it comes to investment and any improvements in the medical space as such. Q. Does this proposition have an autonomous demand? If not then, what are the factors on which it depends? The industry has autonomous demand. 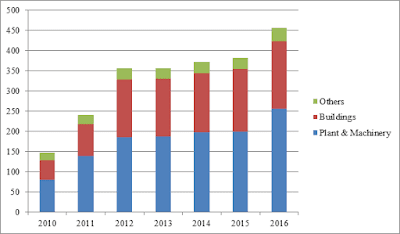 The revenue streams have been growing consistently recording a CAGR of 23% for the last 10 years. Compared to the previous years the revenue per bed has gone up three-fold, although it’s hard to find out when exactly it happened between 2008-16 as the hospital doesn’t provide us with that data, (Above mentioned data has been extracted from MDA’s – wherever mentioned) it is quite clear that hospital has not only grown beds but also revenue per bed – either by charging a premium price or by better utilization rates or both. the revenue streams is very concentrated from a single hospital, although data regarding revenue streams isn’t mentioned transparently, in 2012 and 2013 – Erode centre contributed 4.8% and 4.2% respectively, while Erode Specialty Centre contributed 5.9% and 5.8% respectively. 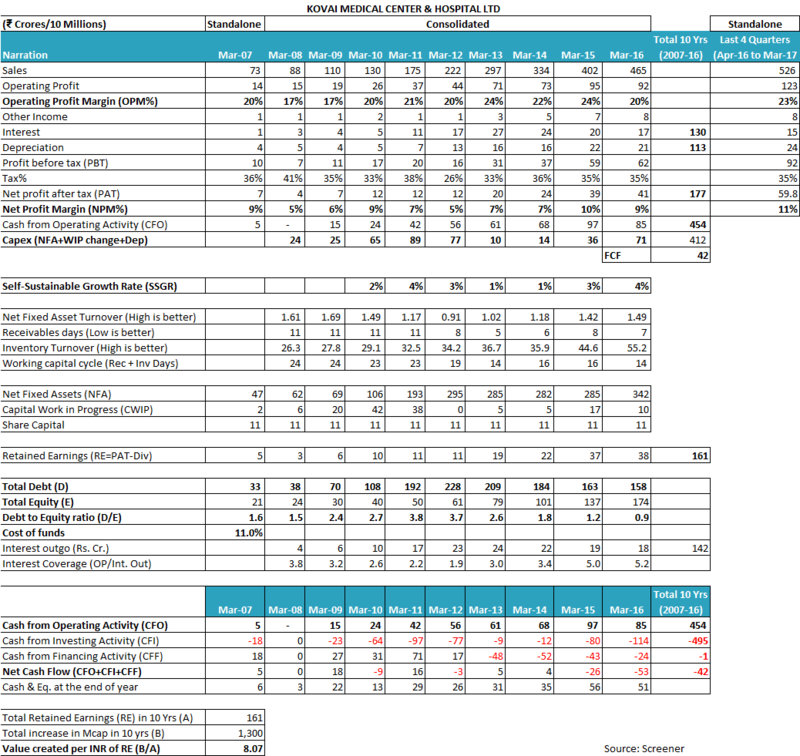 The 5 major costs of operating KMCH have always been constant leaving KMCH anywhere between 33-35% of its sales – hence I don’t see any more operating leverage left to be squeezed from this facility – in fact, the net profitability of the hospital depends on interest expenditure (given that the business is significantly leveraged) and on other expenses – which don’t follow any observable pattern. Running a hospital is a very capital intensive business, hospitals require huge money to not only build its infrastructure – but then later to stuff it with advanced medical equipment. According to a CRISIL report on hospitals (2013) – a 200-300 bedded multi-speciality hospital requires around 70-80 lakh of investment per bed, excluding the cost of land. And when it comes to making a multi-disciplinary super speciality hospital like KMCH, the capital outlay tends to be through the roof. While the number of bed in KMCH have compounded at a rate of 8.69% between 2006-16, the gross block and the netblock has compounded at a rate of 20.15% and 22.99% (keeping in mind the fact that the company has made no out of its reach capital investments in any subsidiary, land or long-term assets except for the purpose of running a hospital and the fact that the company has 79% of its total assets invested in the netblock). It is quite obvious that whenever a business requires so much of money to run and expand its operations, in many if not most cases, the operators of business either choose to leverage or raise equity for expansions, instead of waiting for internal accruals to grow at those levels (and in quite a few cases that are the right thing to do). 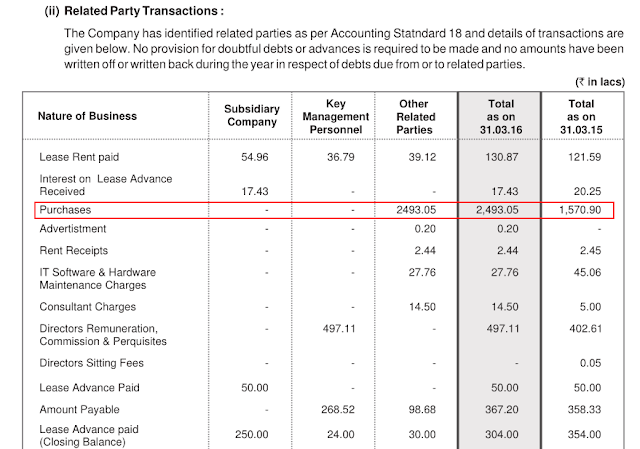 The oldest annual report I ever could find for KMCH was the year 1997, the business at that time had 11.85crores of debt against a total shareholder’s funds of 10.92 cr, the business has been levered ever since, needless to say, that there hasn’t been a single year since ’97 to 2016, where the business is completely free of debt, with the lowest D/E ratio of 0.43 in the year of 2001. Although the company has paid off its liabilities with the help of its strong operating cash flows and reduced its debt to comparatively comfortable levels, it is quite obvious that the management isn’t hesitant to have debt on its balance sheet. It is clear that all of the expansions at KMCH has been funded with substantial parts of debt and accumulated profits. Long-term debt is almost all of the debt the company has availed, the term loans have been availed from mainly two banks – both PSU’s i.e. Indian Bank and Indian Overseas Bank. KMCH has kept at mortgage all of its assets, which are further personal guaranteed by Chairman-MD i.e. Dr. N G Palaniswami and Vice Chairman-JMD i.e. Dr. Thavamani Devi Palaniswami. The term loans carry an interest varying from 10.55% to 11.75%, while other hire purchase loans carry an interest varying from 8.2% to 11%. The company also follows a policy of capitalising borrowing costs for a debt which is used in building ‘qualifying assets’ (assets that take a substantial period of time to build). Interest Expense – here include another cost in acquiring funds. Doubt – in the years when the company is capitalising borrowing costs, the equation of Total Interest Expense (i.e. Interest Expense –P&L + Interest Capitalized) = Interest Outflow (Cash) doesn’t match, given the fact that there are no current liabilities outstanding in the name of ‘Interest Expense Outstanding’ that left the situation. The company has been earning enough operating income – both in accounting terms and in cash – to pay off its interest liabilities. Although debt is a major concern in KMCH, the ability to generate sufficient near recession-proof earning in cash provide a decent level of comfortability with the debt. Hospitals, if running at fuller capacity, can turn out to be cash cows. At KMCH all In-Patients are billed daily for their services and they are required to pay all the dues with 2 days of billing. Quite obviously the company doesn’t carry any debtors on its balance sheet. In fact, in the past two decades, the ever highest that debtors as % of sales have been is 3.8%, while the recent trend is closer to 2%. Minimum of debtors mean a minimum of bad debts and one reason less to worry. There aren’t any long-term investments made by the company, in fact, all long-term investments just form around 0.9% of the total assets. In absolute terms, long-term investments amount to just Rs. 3.72cr, out of which Rs. 3.6cr is on the account of 100% owned subsidiary – ‘Idhayam Hospitals Erode Ltd’ acquired in the year 2008. The financial statements of the subsidiary are consolidated on a line-line basis. The tax expenses and tax outflow seems to be appropriate, with regard to the income. For the purpose of comparing KMCH with its peer’s, I have selected the biggest listed hospital chains – Apollo, Fortis, and Narayana Healthcare. Apollo and Fortis create multi-speciality hospitals like KMCH, at their most precious locations which are generally metropolitans and tier-1 cities, they have no objective in creating a low-cost structure like NH, which as of this moments stand as the only player who has focus on creating low cost-structure. While rest all of the players have invested capital of around 42-50 lakhs per bed, Narayana Healthcare has an investment of just 17 lakhs per bed. Why is it so? It’s because out of the 23 facilities it operates only 4 of them are owned by NH, rest all have either some form of the lease arrangement, PPP, management contract etc. Quite obviously this leaves NH with lower revenue – because in many hospitals they are just paid % of revenue/profits as managing fees and lower margins. As shown in the above table NH has a revenue per bed of less than half of what other peers have. 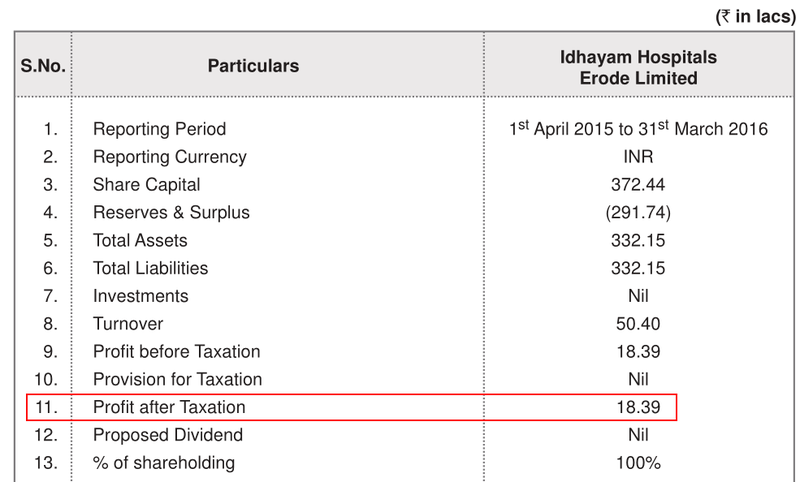 NH also has a net profit margin of 1.19% which is far lower than what other players have. Dr. Nalla G Palaniswami did his MBBS and MD in Stanley Medical College, Madras and served as Lecturer and Assistant Professor of Medicine at Coimbatore Medical College in the year 1973-75. He went to the USA in the year 1975 for his higher studies at Wayne State University in Detroit, Michigan. Studying and working in the USA led to the inception of the idea – of creating a hospital comparable to American standards, back at his hometown – Coimbatore. He began working on KMCH in 1985 and by the year 1990 KMCH started providing its medical service to the people of Coimbatore. Dr. Palaniswami has always been very passionate about the idea of creating an advanced medical institute which provides quality far above average Indian medical practices. The senior most management team comprises mostly of the members of the Palaniswami family, with Dr. N G Palaniswami and his wife Dr. Thavamani Devi Palaniswami at the helm as Chairman-MD and Vice Chairman-JMD respectively. Other members include Dr. P R Perumalswami (Director), Dr. Mohan S Gounder (JMD) and Dr. Purani P Palaniswami (Director). All of them are doctors who have served a considerable period of time in the industry both in the home and abroad. Hospitals business is to a great extent dependent on execution – be it in terms of the project, regular quality, customer experience, and replication of the same at different units/branches. KMCH has successfully proved itself in building a great hospital that has grown from 150 beds to 750 beds, and it’s not just about beds, the kind of services and treatments that are being provided at KMCH makes it one of the best facilities in India. But, that just means that KMCH has successfully passed the first level of executing and running a good hospital, the real challenge between making a good hospital and a ‘hospital chain’ is the difficulty in executing the same at each and every location at which the hospital is present. To provide consistent services and customer experience and creating a hospital that suits the demography of that location is very difficult. Why can’t KMCH continue expanding the earlier way, just adding more beds to the older establishment? Because the growth at KMCH, Coimbatore is saturated. What makes me so sure about saturated growth at KMCH, Coimbatore? (1,600,000/10,000) * 27 = 4320, which the city has already crossed. The bed density in Coimbatore is above the global standards and 4 times of the Indian average. It is very hard to judge KMCH’s ability in creating more than one good hospital, simply because, the company hasn’t done it yet. Although there have been peripheral centres nearby, none of them is of comparable magnitude. What makes the KMCH so interesting at this point is that the company is in the process of creating a 300-bed multi-speciality hospital in Chennai, this project has an estimated cost of Rs. 300crore. A 300-bed hospital means a one-time increase of 30% in the capacity that too at a Metropolitan – which is something KMCH hasn’t experienced yet. Although this project is a bit late – given that KMCH, Coimbatore has been running at optimum capacity for a few years now, I believe that the delay is mainly because of the sheer size of the project. KMCH doesn’t have the strength to support the entire project through internal accruals, the company has already indicated that to finance this project it plans to raise not only debt but maybe also equity. This makes the problem very tricky, given that the debt/equity ratio is around 0.93, although strong cash flows and near-recession proof earning have helped the company to survive debt until now, the road ahead isn’t that easy. And the idea of raising additional equity leaves an existing owner in even more suspense, although this idea was mentioned back in 2014 annual reports and the project somehow wasn’t commenced on account of complication regarding the site of the project, the project is expected to start in 2017. KMCH up till now has grown bit-by-bit, although there have been years that a capacity of 150-200 beds was added in a single year, never in a different location. Generally a hospital takes 3-5 years before it starts running at optimum capacity and the operating leverage kicks in, however, KMCH never had to experience a gestation period so long because all of the expansions have been in the same facility, which is already well-known in Coimbatore and the regions around it. One more thing to ponder over here is that the hospital’s location is in Chennai, which is a very competitive market given that it has many old and established institutes which are one of the bests in the country. It also has listed players like Apollo, Fortis Malar etc. Once the project is started and the source and magnitude of funding are clear, it will be easier to judge this capital allocation decision. Out of the nearly 2 cr of total compensation of MD and JMD (i.e. N G Palaniswami and Thavamani Devi Palaniswami) each, about 70% of it is variable compensation linked to the net profits of the company (i.e. both of them take 2% of net profits as commission) and rest it fixed salary. However, their son – Dr. Mohan S Gounder who is one of the executive directors and JMD takes a fixed compensation package of 82.21 lacks with no performance linked compensation whatsoever. Together Chairman and Vice Chairman took about 10% of the net profits for the year 2015-16, which I think is a bit more. KMCH is maybe over equipped with infrastructure, given that Coimbatore is a small town with just 1.6 million in population, although the market isn’t just limited to Coimbatore, as the hospital speaks, however, there isn’t much data to support this argument. Running a hospital is a capital intensive business, especially when your goal is to be a highly advanced medical institute. Coimbatore has many good hospitals – bigger in capacity, older establishment and some with a few specialities of their own. The hospital has almost recession-proof earnings with consistent revenue growth while maintaining the margins. There aren’t debtors and hence no bad debts. The hospital has created a name of its own, by catering to niche services and developing a habit in doing so. Thanks for sharing the analysis of KMCH Ltd with us! We appreciate the hard work put in by you in the analysis. The time and effort spent in the analysis are clearly visible when any investor notices the different data points extracted by you from different public documents like annual reports, peer comparison with both local peers and listed peers etc. The insightful analysis of the business of KMCH Ltd along with the industry analysis including Porter’s forces would prove highly beneficial to all the investors who wish to study KMCH Ltd.
Let us analyse the performance of KMCH Ltd over last 10 years (FY2007-16). The company used to report only standalone financials until FY2007. From FY2011, the company started reporting both standalone and consolidated financials. We believe that while analysing any company, the investor should always look at the company as a whole and focus on financials which represent the business picture of the entire group. Therefore, while analysing KMCH Ltd, we have analysed standalone financials for FY2007 and consolidated financials from FY2007 until FY2016. 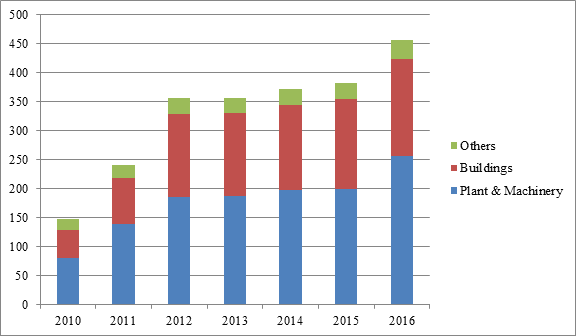 KMCH Ltd has been growing its sales since last 10 years (FY2007-16) at a brisk pace of about 22-23% year on year. It has witnessed its sales revenue grow from ₹73 cr. in FY2007 to ₹465 cr. in FY2016, which is a significant growth. Sales have further grown to ₹526 cr. in the FY2017 (standalone). However, investors as well as we being the member of general public are aware that the health care inflation in India prevails at high levels, therefore, it is not a surprise that KMCH Ltd has been able to pass on the above-mentioned increase in input costs to its customers (patients). As a result, the OPM of the company recovered to 24% in FY2015. The company has again been able to recover its OPM margins to 23% in FY2017 (standalone). Investors would appreciate that the as per different sources, the health care inflation in India is in the range of about 15%. Therefore, it is not difficult for any well-run hospital to multiply its revenue by 3-4 times over 10 years without any increase in a number of beds. [(1.15)^10 = 4.05]. The net profitability margins (NPM) of KMCH Ltd has been moving in line with its OPM except in certain years where the interest cost due to its debt levels has depressed NPM in comparison to OPM. KMCH Ltd has been paying taxes at a rate of 33-35%, which have been in line with the standard corporate tax rate over the years. You have rightly highlighted that the hospital industry is a capital-intensive industry, which requires continuous investment on account of new technology making way into medical treatment processes. Therefore, an investor would notice that hospitals are an expensive proposition to maintain in terms of keeping them up to date with the latest advancement in the field of medical & surgical treatments. This requirement of significant capex needing proper planning is not only limited to updating the medical equipment at existing hospitals. Creating new hospitals/increasing the number of beds in existing hospitals also involves significant capital expenditure. The above analysis would indicate an investor that establishing and running a hospital by keeping it up to date with medical advancements is a costly affair. Therefore, it is no surprise that the net fixed asset turnover ratio (NFAT) of KMCH Ltd, which has been very low over the years, while being less than 1.50 for most of the years. The NFAT declined to its minimum of 0.9 in FY2012 when it did a major expansion. The NFAT has since improved to 1.49. As per the management, it plans to do a major capex of about ₹300 cr. on a new hospital in Chennai, which is again expected to push the NFAT to lower levels. The working capital management of KMCH Ltd has been very good with high inventory turnover ratio (ITR) and low receivables days over the years, which has been rightly pointed out by you that is due to the nature of the business of healthcare service providers. Most of the billing is done by the hospitals as an advance or over the counter in outpatient department (OPD) and in the case of indoor patients (IPD), the admissions are granted only after deposit of significant advance amount, which needs to be topped up by patients on regular interval during the stay at the hospital. Therefore, KMCH Ltd has been able to maintain its working capital days at efficient levels of about 14-16 days over the years. The investor would notice that KMCH Ltd has an SSGR of about 3-4% in the years whereas it has been growing its sales revenue at a growth rate of 20-23% in over the years. Upon reading the SSGR article, an investor would appreciate that if a company attempts to grow at a sales growth rate, which is higher than the SSGR, which it can afford from its internal sources, then will have to rely on the funds infusion from outside in terms of debt or equity. The same has happened in the case of KMCH Ltd.
Over FY2007-16, KMCH Ltd has witnessed its sales increase from ₹73 cr. in FY2007 to ₹465 cr. in FY2016. For achieving this sales growth the company has done an additional capital expenditure (capex) of ₹412 cr. In addition, the company had an interest expense of ₹130 cr. over FY2007-16 to service the ever-present debt on its books. Therefore, KMCH Ltd had to do meet a cash outflow of about ₹550 cr. to meet the capital requirements to expand its medical centres and keep them updated with latest technologies. However, the investor would notice that KMCH Ltd has generated a cash flow from operations (CFO) of ₹454 cr. over FY2007-16 resulting in a shortfall of about ₹100 cr, which has been met by the company by raising incremental debt of about ₹125 cr. over FY2007-16 (₹158 cr. – ₹33 cr.). 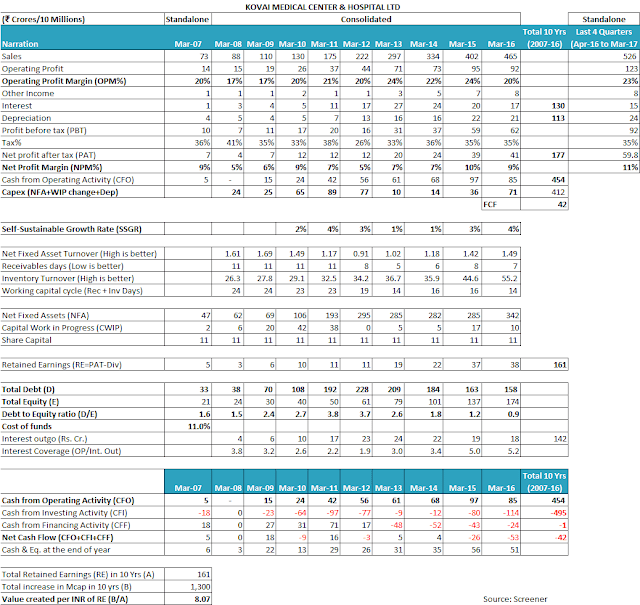 The above analysis re-emphasizes the conclusion arrived earlier that creating and running hospital assets is a highly capital intensive business and it is quite evident that despite achieving remarkable growth rate, good profitability, maintaining very efficient working capital, the capex requirements of KMCH Ltd have been high in comparison to the cash generated from operations and it has to rely on incremental debt to meet such capex needs. It comes as no surprise to investors that the company would have to raise further debt to expand its facilities further when it creates its new hospital in Chennai. However, it is good to see that until now, KMCH Ltd have kept the debt levels within check and have maintained good debt serviceability matrices. At an interest rate of 11.75%, the company has an interest coverage of above 5, which is a comfortable position. The interest coverage has improved over the years from the low levels of 1.9 in FY2012 when it has done a major capex. Since FY2012, the company has utilized the new capacity well and as a result, it has been able to reduce its debt levels from ₹228 cr. in FY2012 to ₹158 cr. in FY2016. An improvement in credit rating is beneficial for any company as its leads to a reduction in the interest rate for its existing facilities as well as improves the probability of getting funding for its future capex plans. In the similar aspect, it would help KMCH Ltd in meeting the funding for the proposed new hospital units at Chennai. It is advised that an investor should keep a close watch on the debt levels of the company going ahead. The ability of KMCH Ltd to grow its revenue with good profitability, ability to optimally utilize its expanded capacities and keep its debt levels under check seem to have been looked favourably by the market. As a result, the company has witnessed an increase in market capitalization of ₹1,300 cr. over last 10 years against the earnings retained and not distributed to shareholders of about ₹161 cr. The company was promoted by Dr Nalla G Palaniswami and his wife Dr Thavamani Devi Palaniswami in 1985. Currently, three children of the founder couple: Dr. Mohan S Gounder, Dr. Arun N Palaniswami and Dr. Purani P Palaniswami have joined the company. They have taken positions on the board of directors and seem to have active participation in the day to day affairs of the company through the positions like Joint Managing Director and Whole Time Director. Succession planning is an essential aspect of management analysis of any company as it reflects the faith of the promoter management in the company. As per the above disclosure, the subsidiary company, Idhayam Hospitals Erode Limited made a profit after tax (PAT) of ₹18.39 lacs during FY2016. However, when an investor reads another section of the annual report of KMCH Ltd for FY2016, page: 136, then she notices that the subsidiary company Idhayam Hospitals Erode Limited has made losses of ₹14.58 lacs during FY2016. It is, therefore, advised that an investor should seek clarification from the company about the performance of its subsidiary company and whether the information disclosed in FY2016 annual report has any errors. As per the data presented in the FY2016 annual report of KMCH Ltd, page: 106, the company has made purchases of about ₹25 cr. from companies related to promoters in FY2016. The amount of purchases has increased from about ₹15 cr. in FY2015. We believe that investors should analyse related party transactions between the company and promoters/promoter controlled entities in-depth about whether these transactions are at arm’s length basis. Investors should tread carefully in such circumstances as there have been many cases in the past (like the recent case of Raymond Limited, source IiAS), where allegations have been made on promoters using transactions with publicly listed entities to benefit themselves. The managerial remuneration of the promoter management of KMCH Ltd seems high, however, it is a norm in the healthcare industry where the reputation of the consultants/doctors acts as a pull factor for the customers. As a result, reputed doctors are able to command good remunerations. However, it is advised that investors should always compare the remuneration levels with the performance of the company. Read Further: Why Management Assessment is the Most Critical Factor in Stock Investing? We believe that an investor should seek clarification from the company about its actual attrition levels and whether the company is ok with high attrition levels and whether the high attrition levels are associated with its above-mentioned remuneration policy? As per the FY2016 annual report, page: 96, KMCH Ltd has lost its case in the District Court, Erode about its claim on the ownership of a land parcel. As per the report, the company has filed an appeal in the Honorable High Court of Judicature, Madras, which is currently under process. An investor should seek clarification from the company about the current status of this land dispute and whether it impacts the future expansion plans of the company. 1) Doubt – in the years when the company is capitalising borrowing costs, the equation of Total Interest Expense (i.e. Interest Expense –P&L + Interest Capitalized) = Interest Outflow (Cash) doesn’t match, given the fact that there are no current liabilities outstanding in the name of ‘Interest Expense Outstanding’ that left the situation. Many times, when companies capitalize the interest cost on the debt taken to fund the fixed assets, then they show this interest cost as part of the value of the fixed assets created. As a result, this interest cost gets classified as part of capital expenditure done by the company. We appreciate the unique approach followed by you to estimate the demand/market potential for the hospital beds in Coimbatore micro-market. We believe that industry analysis is the aspect of stock research, which is most contentious. This is because it involves factoring in macro factors, which can be interpreted by different investors differently. We believe that the well-run healthcare infrastructure of a location caters to a population, which can exceed the local population. Medical tourism is a good example, which indicates that the healthcare infrastructure of Coimbatore is also serving the overseas population as well. Moreover, the parameter of 27 beds per 10,000 population is the average number of beds over world population. It is not the maximum upper limit. There are countries, which have higher bed density and as the healthcare infrastructure in India improves, there is no reason why India cannot have a higher bed density than the world average. Despite our views, we believe that the unique approach adopted by you for calculating the demand potential is an insightful one. Such approach is very helpful in arriving at answers to multiple problems in different domains related to stock analysis. Currently, KMCH Ltd is available at a price to earnings (P/E) ratio of about 22 based on last 12 months of standalone earnings, which does not offer any margin of safety in the purchase price as described by Benjamin Graham in his book The Intelligent Investor. Overall, KMCH Ltd seems to be a company, which has been growing at a fast pace of 22-23% year on year for last 10 years (FY2007-16). The company has been able to achieve this fast paced growth with good operating margins along with efficient working capital management, which is in line with the dynamics of the healthcare industry in India. The company operates in a capital intensive business, which requires significant investment to create new facilities as well as to keep the existing facilities updated with latest medical technologies. As a result, KMCH Ltd has to borrow additional funds to meet its capex requirements and to service existing debt on its books. The requirement of external sources of funds also gets established when an investor notices that the company has been growing at a pace higher than its self-sustainable growth rate (SSGR). It is advised that an investor keeps a close watch on its debt levels going ahead. The company has plans to create a new hospital in Chennai where the ability of the company to complete the construction within time and cost and then quickly raise the utilization to optimal levels would be essential to keep the debt burden under check. The promoters of KMCH Ltd seem to have taken steps towards management succession planning where their children have joined the company in key managerial & board positions and seem to be playing an active role in day to day operations of the company. The employee costs along with promoters’ remuneration of the company are high, however, these are still justified considering the nature of healthcare industry, where reputed doctors are the key reason for customers (patients) to visit the hospital. However, the related party transactions of the company with the promoters’ related entities need to be analysed in greater detail. Investors should seek further clarification from the company about the contradicting profitability data about its subsidiary Idhayam Hospitals Erode Limited, high attrition levels, and disputed land transaction. These are our views about KMCH Ltd. However, you should do your own analysis before taking any investment related decision about KMCH Ltd.